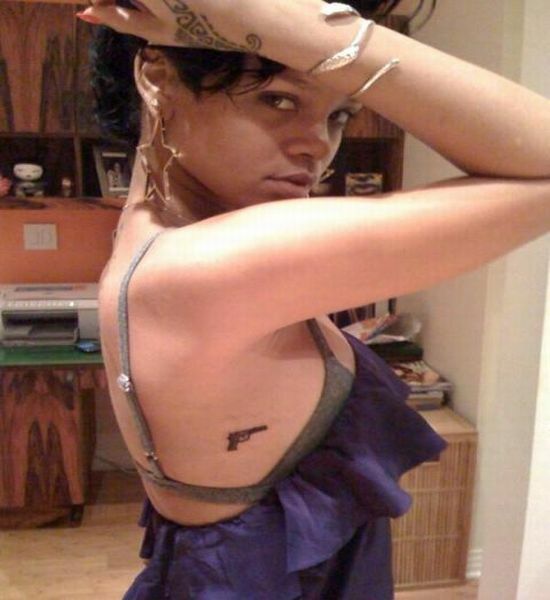 Home Off Beat	Rihanna gets a thought provoking gun tattoo! Remember the incident, which our beloved singer Rihanna had to face a few days back? Well, letâs not talk about it as she too seems to be coming out of it. No matter how much life gets them down, tattoo fanatics make up for it through their increasing love for tattoos. Rihannaâs tattoo craze too has increased with time. She has added a new tattoo to her big collection. Itâs a thought-provoking gun tattoo this time, which she has got etched across her ribcage. Done by NYC-based tattoo artist BangBang, itâs a cute little tat that looks just incredible! ← Peeping skull tattoo: Creepy yet funny!